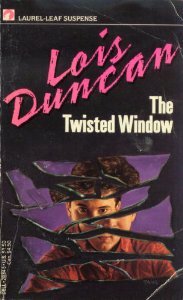 It has been sixteen years since I read The Twisted Window by Lois Duncan, and I am still shocked that it has yet to become a movie. You’ll know the name Lois Duncan from the film I Know What You Did Last Summer, she wrote the book, if you hadn’t guessed. When that movie broke big, the name Duncan became a hot one – until it burned out with I Still Know What You Did Last Summer, even if she had no connection with it. During that quick moment of time there were a few strait to video movies based on her books. I’ve Been Waiting For You, based on Gallow’s Hill, was a supernatural slasher that felt like a feature length episode of Are you Afraid of the Dark. And Killing Mr. Griffin was more boring than your typical Lifetime movie. I figured The Twisted Window would be a shoe-in for the direct to video treatment. Hell, I wouldn’t have been surprised if freaking Lifetime made it given the subject matter. This was the first book I can recall blowing my mind. Up until that point I’d only managed to finish one or two Goosebumps titles. The Twisted Window read like a thriller film and it held on to me with a vice grip. By the end, I was so crazy for it, I ran to my mom and told her she HAD to read it! After we had a talk about it. The conversation basically added up to me asking, “Is your brain doing jumping jacks right now too! ?” She liked it just fine. Obviously she’d been reading thrillers for decades and I’m sure she found nothing new in the pages of a teen novel written in 1987, but it was nice for her to humor me. I’d like to go back and re-read it. See if it still makes my brain do jumping jacks. Maybe I’ll give it to someone younger and see if they flip for it the way I did. You should do the same.